In a recent post, I reflected upon the way in which the Apostolic Faith sets apart this time of year before the feast of the Nativity to await the coming of the Lord. This anticipation goes against much of the season which is already calling now Christmas, and yet sadly does not celebrate the Feast for what it is, nor when it was historically celebrated. As an example, most Americans assume that the twelve days of Christmas are some kind of countdown, when they really find their roots in December 25th and the following days. We cannot really Feast if we do not really Fast, as so many have noted over the years. Nevertheless, as real as the expectation of Christ is during the season normally called Advent or the Philip’s Fast, there is another understanding that Christ the Eternal God is always present among us. He who was Crucified and Risen was first Incarnated on earth as an infant in a manger, and yet greater than any sequential reflections about God is His Eternal Being. As the Greek inscription “ὁ ὤν” expresses in the halo, Christ God is “the One who Is”. Despite Ever Existing and being yet Ever the Same, the One who Is was born at a discrete point in history. And despite the emphasis on not celebrating His Birth earlier than the Feast which focuses on this event every December 25th, there is a curious reality in our prayer life as Byzantine Christians that serves as wonderful tension over our expectation of Christmas and its Eternal Reality. During the Canon of Matins, the Odes and hymns that are unique to different times of the year are called Katavasiai. In the 2012 Typicon which my parish follows to select the appropriate songs for each day, one particular Katavasia in the year covers November 21-December 31st, excepting December 5th. This Canon is known as the Canon of the Birth of the Lord. Christ is born: glorify Him. Christ from the heavens: go out to welcome Him. Christ on Earth: exalt Him. All the Earth, sing to the Lord, and praise Him with joy, O peoples, for He is glorified. I see a strange and marvelous mystery: Heaven is a cave; the cherubic throne a Virgin; the manger has become the place in which Christ the Incomprehensible God lies down. Let us praise Him and extol Him. What is so fascinating about this is that we sing these glorious hymns to the newborn Christ between November 21st and December 24th at Matins, in addition to December 25th-December 31st. The expectation of Nativity is punctuated by our transcendence of time, as we celebrate the very feast that we are waiting for in Matins. Come O Jesus Our Savior, Redeem and Save Us! Fr. Edward Cimbala is the administrator for the Byzantine Catholic (Ruthenian) Eparchy of Passaic, NJ. As a parish priest and one involved on a higher level of the Church, his reflections on our vocation to serve God and love one another were beautiful, timely, and quite relevant. Fr. Edward delivered the fourth main talk at the West Coast Eastern Catholic Encounter. He spoke first and foremost, of a blueprint for church growth. Each person was handed a gift/blueprint to define what this gift was, is, and always has been. To my great pleasure, this blueprint was the words of our Symbol of Faith, the Nicene-Constantinopolitan Creed (sans Filioque, naturally, given our Eastern Catholic audience 🙂 ). Fr. Edward stressed that if one were to go online and do a search on Amazon for Church Growth, there would be many hits in the search threads. These hits would reflect a variety of theories represented by many books. We may want to blame turnover and the new pastors we are “stuck with” when old charismatic pastors move on. But if we go to the Holy Scriptures, the life of the Church wasn’t based on principles, but personality. There was only One book needed, the Bible. Paul in Thessaloniki in acts could not be silenced. His message was so life-giving that they persecuted Jason, but the Church moved on. This message of a recipe/blueprint for Church growth was a wonderful story. In his second main point, Fr. Edward moved to speak of ways in which we can be side tracked or distracted on the road. In doing so, he pointed out that as new servants in the harvest, we begin enthused and jump in wanting to do everything, but then we get tired. The danger, however, is that we can easily end up feeling like nothing is worth it. When we have too much motion without movement, we are not understanding our own vocation, not matching our gifts with our vocation. The right fit will energize us to lead others the right way, and as such we will enjoy it. This message on finding our proper home to fill out the life of Faith is so important, because so many times we are expending efforts in arenas where our efforts are not to our own benefit, let alone those with whom we come into contact. The third point from Fr. Edward’s talk that I would like to highlight is the imagery of the Church as a Body, which was illustrated through two great stories. First, Fr. Edward shared his own musical interests as they relate to the life of the Church. In the performing arts, one can see the harmony of instruments in an orchestra. In an orchestra, there is a melodic power that is beyond one individual instrument. This is a true picture of the church. Each instrument is there but all instruments are needed to create the beauty of the symphony. God chooses who will play what. He is also the composer, the music is suited to each member of the orchestra. We all know about the diversities of gift from one giver. The spirit is given to each one, for the common good. The Spirit is not for making one person look or feel good. No one can say that they don’t have gifts. These gifts give us great joy. So we must discover them, but how? 2. By trial and error. Nothing wrong with failing, important is to learn. 3. Ask someone what gifts they think that you have. Your friends will most often tell you the truth. 4. Take a test-sometimes asking the right questions leads us to find the answers we need to know how we can help. The Body of Christ is many, not comprised of one member. Our role blends with who we are and what the church needs. Fr. Edward gave the second example beyond the symphony by moving to sports. In Baseball, Dizzy Dean was able to play well 30 games in a row. He was even a key pitcher in the 1934 World Series. However, in 1937 he hurt his big toe, which affected everything. Each member is important, just like Dizzy Dean’s toe. This important lesson on the way that we all play a critical role, despite our differing roles, was a key message to the laity. Instead of seeing our diverse roles and gifts as ways to stratify who is “important” who is “irrelevant”, we see our spiritual roles as all being important to the life of the Church. We as big toes (or other anatomical parts) must see our importance and embrace our roles in the Church. If I were to offer a point of criticism of this talk, it would be a point on asking how we could be equipped with more examples of how we are doing things wrong as both laypeople and clergy. Fr. Edward’s talk was so positive that the negative elements of our life in Christ were harder to clearly pinpoint as I listened to him. Expressing those problems more clearly might be more insightful for those who want to live that life of repentance, where we change from our flawed ways. Come O Jesus, Our Savior, Redeem and Save Us! As a convert to the Apostolic Faith, I have dealt with emotional and spiritual baggage from many sources, not the least of which is my time spent as an Evangelical who held to what is called “dispensational premillenialism”. There was a time where my own goals in life were chided as being too “long term”, since the Lord was “coming soon”. 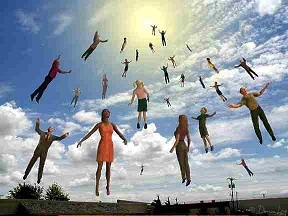 This all consuming call to wait for the coming of Christ via the “rapture” held so much that is destructive, in the name of faith, hope and love. It has therefore been a painful and difficult matter for me to align my heart with hopes for Christ to come again, as we profess this reality in the Nicene Creed. Praying this pre-Nativity season, however, I have felt much comfort in the particular services of the Church year. Asking Christ to come to us in a special way is a foreshadowing of the special celebration of His Birth and Incarnation on Christmas, but this call is something where we ask Christ to enter the stable of our hearts, to cleanse us of our spiritual “manure”, so that we may be saved of our own sinfulness. In praying these words, I realize that the hope for Christ to come to save His people through the Rapture, theologically (and chronologically) incorrect as it is, touches upon a most important concept. We need God to save us at every instant of our life, and when He comes to us to save us, as an infant baby or as the judge of all Creation, all that is wrong is made right, and there is peace. Calling for such peace and reconciliation is something which I will never regret about my time as a Protestant. But that it will happen definitely in my own heart if I believe these words this Philip’s Fast…that is something that overwhelms the heart. It does not rely on headlines changing for the worse, or Antichrists knocking down society, or Christians flying into the heavens. It rests, instead, upon my own willingness to lay down my life so that the new life of Christ will be reborn each morning, whether it’s December 25th or not. The third main talk that was given at the 2012 Eastern Catholic Encounter West Coast was by Father Deacon Sabatino Carnazzo. Father Sabatino is quite a dedicated and dynamic speaker, as evidenced by his additional ministry through the Institute of Catholic Culture, which he founded to help support lay catechesis and spiritual education. His talk at the Eastern Catholic Encounter wove similar threads on the role and vision for lay leadership in our Eastern Catholic Churches as the previous speakers whose talks have been posts on this site. Like those other speakers I would like to highlight three key messages that spoke to me most from that weekend. The first key point by Deacon Sabatino is that it is important for us as lay people (or clergy) to always define our vocation as something that is positive, not negative. We are ideally defined not by what they can’t do, but what they can do. To explain that our Tradition does not take lay people and relegate them to some fundamentally different Christian existence from the clergy, he called us to consider the liturgical practices of our Churches. At his ordination, a man being ordained to the diaconate is clothed with deacon’s vestment. To do this, he does not strip away his baptismal garments. In describing salvation history, Father Sabatino turned our attention to the Holy Gospel of the Evangelist John the Theologian. In John 1:14, we read that Christ the Logos came into the world, but his own people did not receive Him. To those who did receive Him, however, He gave them the power to be His sons. Father Sabatino emphasized that we cannot understand this gift of being sons and daughters of God until we see it through the prism of our baptism into Christ. To do this, we need to consider a key passage on baptism. In Romans 5 we read that we were baptized into Christ-yes, even into His Death. This means that our Baptism is not meant to merely be a model of the Theophany, where the glory of the Baptism and the peace of the Baptizer beholding the scene prevailed. Instead, we must see our union with Christ to be a model of all of His life and yes, His death. That we all have our own union with Christ’s life, death, and resurrection may make more sense of our own travails on this earth, if we have the eyes of faith to unite ourselves with this vision. In contrast, from his Pastoral Epistles, we can see that Paul rejoiced in Timothy growing up in the faith. Timothy took on his own vocation and there was no appeal to how Paul did things. Timothy would eventually grow up and be in charge based on his own unique vocation, and this is something we must see in our own vocations. What can stop us from doing so? Father Sabatino pointed to our quintessentially American flaw of what he called the “Me first!” syndrome-we must take leadership in the parish but not be imposing upon the unique gifts of others. So often this (and other factors) lead people to leave our parishes. If someone were to leave our parish, we must also ask ourselves: what do we do about this, if anything? As His hands and feet in the one body, we must live in prayer and love one another, seeking reunion and reconciliation. After all, best friends spend time together, and when we do not mirror that in our mystical reality as the Body of Christ, we can only suffer as a result. In closing my one point where I would like to call for correction/emendation in Father Deacon Sabatino’s talk was towards the beginning. In discussing the centrality of the Holy Scriptures, Father Sabatino asked how many participants in the Encounter had brought their own Bibles. Few people (if any) raised their hands at this point. He used this to point out that in our American society, so many Evangelical Protestants carry their Bibles wherever they go. He warned them of the reality that many Eastern Catholics have left our Apostolic Churches for these ecclesial communities because so many Protestants read their Bibles and have the habit of carrying their Bibles wherever they go. They bring with themselves arguments meant to deride Tradition and promote their own viewpoints, which have led some of our Faithful to depart from our Churches. Father Sabatino suggested that if we do not carry our Bibles with us, we are asking for further defeat against these Evangelicals. As a former Evangelical, I would counter that this point needs some further refinement before it is accepted carte blanch. If we would only carry the truth of our faith and understand our liturgical traditions with their deep Scriptural treasures, we would not need to carry a physical Bible with us. Instead, our hearts would overflow with the truths of those Scriptures that we know and love, as we seek to see God in our spiritual hymns and liturgical services. Nevertheless, I echo his sentiments that the Scriptures should be closer to us. I just think that we can feel their truth even more closely than having a physical Bible with us, if our Church prayers are deeply incorporated into our hearts, minds and souls.